The New Orleans Police Department’s First District is asking for donations of $50 to purchase bicycles for the Pre-K, Kindergarten and 1st grade students at Phyllis Wheatley Community School. This is the 5th year N.O.P.D.’s First District is giving bikes to school kids. A different school is chosen each year. This year, the bikes will go to students at Phyllis Wheatley Community School at 2300 Dumaine Street. Most of the students at Phyllis Wheatley are very needy (but not all). The School Resource Officer got a head count of the Pre-K, Kindergarten and First Graders; approximately 200 students need bicycles. Blank check with false numbers in a blue tone. 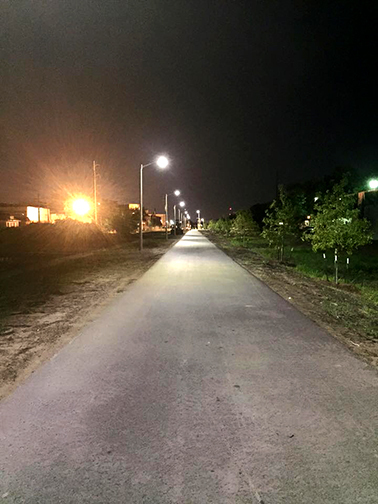 Lafitte Greenway lighting. Photo courtesy Jennifer Ruley. The Lafitte Greenway Bicycle and Pedestrian Path includes a 12-foot wide asphalt path for bicyclists and pedestrians, new recreation fields and green space, landscaping improvements with over 500 trees, native meadows, rain gardens, trail lighting, storm water retention features, curb extensions, signal-enhanced high visibility crosswalks, ADA-compliant curb ramps at sidewalk corners, environmental remediation and a crushed stone walking path. A bicycle/pedestrian roundabout links the Lafitte Greenway with the Jefferson Davis Parkway and Wisner Bike Trails. At this time, the Lafitte Greenway Bicycle and Pedestrian Path is managed by the City of New Orleans. The City is working with The Trust for Public Land, a national nonprofit dedicated to conservation, on a long-range management structure to ensure the Lafitte Greenway’s operation and security. The Trust for Public Land was also a partner in the development of the Lafitte Greenway by acquiring and donating property for the project. With assistance from the Urban Waters Federal Partnership, an innovative federal union comprised of 14 agencies, the City is receiving technical support to promote the Lafitte Greenway’s long term viability. Because of heavy rains in the spring and summer of this year, the recreation fields and greenspace adjacent to the Lafitte Greenway Bicycle and Pedestrian Path remain closed to the public as grass and meadow plantings continue to establish. Because of the growing season in New Orleans, these areas may not be fully established until late spring 2016. The City is monitoring its contractor, Durr Construction, as it maintains the fields and landscaping during this period. The City requests that the public stay on the multi-use trail and avoid walking on the grassy areas during this period. Until the City fully opens the Lafitte Greenway’s recreation fields and green space, no official activities or events will be permitted. With the completion of the Lafitte Greenway Bicycle and Pedestrian Path, New Orleans now has 100 miles of designated bikeways. The Lafitte Greenway Bicycle and Pedestrian Path connects to bikeways in the French Quarter and Central Business District via the Basin Street/ Loyola Avenue bikeway. It also crosses existing and future bikeways on North Galvez Street, North Broad Street, and North Jefferson Davis Parkway. Before Hurricane Katrina, there were only five miles. The Lafitte Greenway Bicycle and Pedestrian Path is part of the Lafitte Corridor Revitalization Plan which was developed by the New Orleans City Planning Commission in conjunction with the City’s Department of Public Works. The Lafitte Greenway Bicycle and Pedestrian Path was designed by Design Workshop and constructed by Durr Heavy Construction. Diedonne Enterprises, A&A Enterprises, Metro Service Group, Traffic Solutions, Balthazar Electrik, Contractor’s Source, RLH Investments LLC and Twin Shores served as DBEs on the project. Funding for this $9.1 million project comes from Disaster Community Development Block Grants and Louisiana Recreational Trails Grants. 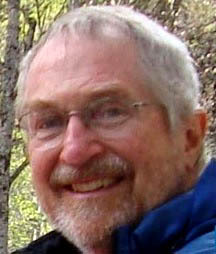 Faubourg St. John neighbor Dr. Howard Mielke has worked hard for decades to investigate and study the effects of lead. He has been a champion for children by pushing to have lead remediation performed in New Orleans’ playgrounds, parks and anywhere children play. 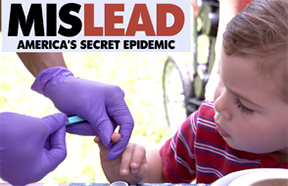 Lead is an insidious threat that you and anyone with children should learn more about. Don’t brush this off as a non-issue. It is truly important to your health and the health of children. Dr. Howard Mielke has a treasure trove of scientific information about lead. He can explain the scientific facts as simply as you like or get into the intricate details if you want to know more. When it comes to facts about lead and why it should be removed from where children play, Dr. Howard Mielke is “the man”. You have an opportunity to learn more and to meet with your neighbor Dr. Howard Mielke at the New Orleans Museum of Art Theater on April 23rd at 6:30 p.m.
View the entire film on April 23rd at 6:30 p.m.
in the New Orleans Museum of Art Theater in New Orleans City Park. 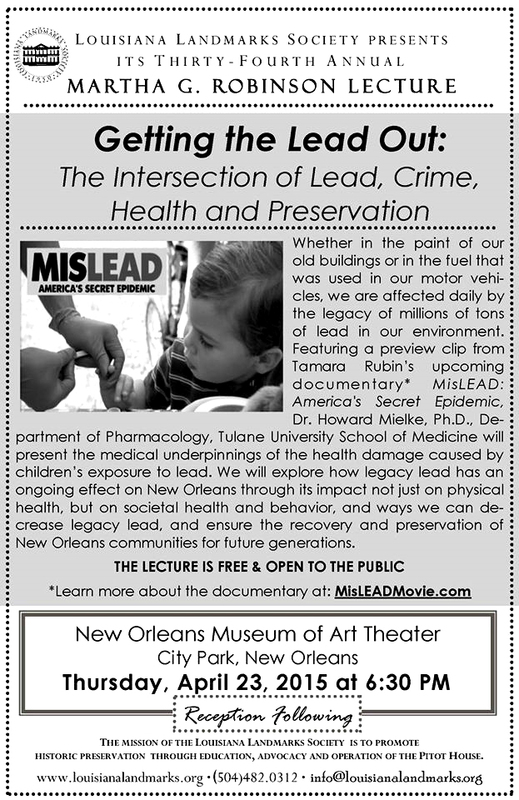 This year’s Martha Robinson Lecture features clips from the documentary film MisLEAD: America’s Secret Epidemic and a presentation by Faubourg St. John neighbor Dr. Howard Mielke, Ph.D., Department of Pharmacology, Tulane University School of Medicine. Whether in the paint of our old buildings or in the fuel that was used in our motor vehicles, we are affected daily by the legacy of millions of tons of lead in our environment. The film establishes the medical underpinning about health damage caused by children’s exposure to lead-based paint. In addition, the rise and fall of fuel lead additives are described for New Orleans. MisLEAD shows that legacy lead has an ongoing effect on New Orleans through its impact not just on physical health, but on societal health and behavior. Finally, the film depicts efforts to decrease legacy lead, and ensure the recovery and preservation of New Orleans communities for future generations. 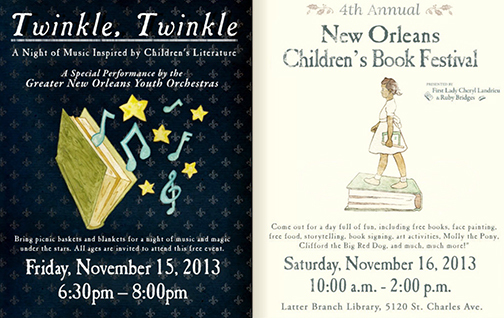 Friday, November 15, 6:30 p.m. – 8:00 p.m.
Twinkle, Twinkle is a special performance by the Greater New Orleans Youth Orchestras in celebration of the 4th Annual Children’s Book Festival. On the evening of Friday, November 15th, the Youth Orchestra will perform music inspired by children’s literature. Bring picnic blankets and baskets for a night of music and magic under the stars! Come out Saturday for a day full of fun, including free books, face painting, free food, storytelling, book signing, art activities, Molly the Pony, Clifford the Big Red Dog, and much much more! 10 a.m. until 2 p.m. at the Latter Branch Library at 5120 St. Charles. Join us for the 4th Annual New Orleans Children’s Book Festival on November 15 & 16, 2013. This year, we’re kicking off the year of imagination in partnership with City Year! City Year will help keep the spirit of the New Orleans Children’s Book Festival alive all year long. The free festival features storytelling, live music, food, and fun activities for kids of all ages! First Lady Cheryl Landrieu and Ruby Bridges both believe strongly in literacy and in the power of education. They also believe in the powerful effect that learning can have in bringing children together. This event affords children from all backgrounds the opportunity to get to know one another through the love of books and learning. 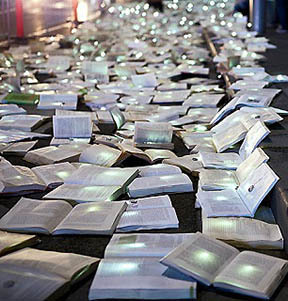 The festival offers unique opportunities for children and parents to interact with exceptional writers and storytellers and to enjoy an inspiring variety of book-related activities, exhibitions and demonstrations. The food, fun, books, and stories are FREE! For more information, please contact info@rubybridgesfoundation.org. Beta Phi was founded in 1938 on the campus of Dillard University and is celebrating its 75th Anniversary this month. As part of its anniversary celebration, Beta Phi has planned a community wide book giveaway to positively impact the lives of thousands of children in the New Orleans area. The books are complimentary of Rosen Publishing. Representatives from the City of New Orleans’ crime fighting initiative NOLA For Life, State Representatives Wesley Bishop and Vincent Pierre, Roger Rosen of Rosen Publishing, and Erika McConduit-Diggs of the Urban League of Greater New Orleans will join Jared Brossett at the event. The giveaway will occur along the Student Union Breezeway at Dillard University from 10 a.m. to noon following a 9:00 a.m. panel discussion on the importance of Early Childhood Literacy. One of the most effective approaches to helping children develop literacy skills is having a home environment that supports literacy. Books have the power to benefit children in a number of ways, so I encourage you to take advantage of this opportunity to improve your child’s literacy. The New Orleans Recreation Development Commission (NORDC) is actively seeking residents to join the NORDC Neighborhood Participation Process (NPP). The NORDC NPP creates 15 location-based Community Advisory Teams (CAT), three per a council district. Team meetings allow citizens to come together to discuss and prioritize what gets recommended to NORDC on an ongoing basis. CAT membership is a 12 month commitment with an opportunity for residents to work with NORDC staff, neighbors and commissioners on recommended recreation improvements that will ensure the communities concerns are a top priority. If you are a parent, member of a booster club or community group, we encourage you to participate. The application deadline is November 13, 2013 followed by a new member orientation on November 16, 2013. Orientation will take place at 10:30am in the UNO Lindy C. Boggs International Conference Center at 2045 Lakeshore Drive. Completed applications can be submitted to the Neighborhood Engagement Office, faxed to 504.658.4969, or emailed to neighborhoods@nola.gov. Explore NOMA’s permanent collection and special exhibitions! Professional teaching artists in a variety of disciplines encourage creativity and imagination as campers create projects in an array of different media. To register for camp, contact Elise Solomon at education@noma.org or 504-658-4128. Per each Monday-Friday session. Materials are included. Payment is due the Monday before camp begins. Please note campers registered for the full-day must bring a sack lunch. Discover innovations presented at the World’s Fairs of the past century then create drawings, paintings and sculpture that envision life in the future. ◾ON THE STAGE: What’s the Story? Learn the fundamentals of telling a good story! Explore museum galleries and the sculpture garden to discover heroes for your stories then learn how to “spin a good yarn” using character development and story progression. Explore the art of printmaking! Monoprints, screen prints and spontaneous printing with everyday objects will be explored in this celebration of the multiple. ◾ON THE STAGE: You Make the Rules! Take your imagination as far as it can go during the Improvisation Camp! Build a universe and make it dance! Improvise like you’re a wizard. Learn creative ways to recycle by making fun functional objects and art from found objects and cast offs. ◾ON THE STAGE: Make a Scene! Visit NOMA’s galleries to discover people and stories in the works of art, then develop characters and short scenes based on what you have seen. Embark on a global adventure! Chart your course on a map and design your own passport to track your travels as you travel the world in NOMA’s galleries. Explore different styles of puppetry from around the world and then build puppets inspired by works of art in NOMA’s collection. What kind of machine would you like to invent? Transform found objects into a sculpture of an imaginary machine and create a poster to advertise your invention. Master the art of storytelling as campers write and recount their own tales based on works of art in NOMA’s collection. Discover how artists have represented nature throughout time in this printmaking camp that explores multiple ways to create prints. Build a scene, a city, an entire world with your scene mates. Learn agreement and trust as you work with your partners to take whatever is thrown at you and turn it into a peg-legged sailor on a high-wire. Comedy is our ship, teamwork is our fuel. Get ready for the runway by creating your own wearable works of eco-ware, art and fashion. Interpret museum works in a one act play created and produced by NOMA campers! Go on a weeklong adventure around the world without leaving NOMA! Create paintings, prints and mixed media works of art about the unique places you discover. Design puppets and set the stage for a puppet show. Puppet traditions from around the world will be taught as students get into the act.